How do you fit all 151 original Pokémon in one pokéball? Graphic designer Deanlord shows us how in one amazing t-shirt design, available for only a few more hours through TeeFury.com. The humble artist captures the spirit of the original Pokémon games in this gorgeous gathering of 151 pocket monster pals, tastefully silhouetted against a black background and arranged as if to protest the very prison the inhabited for so many years. As much as I like the new generation of Pokémon, the original 151 were and always will be the best. 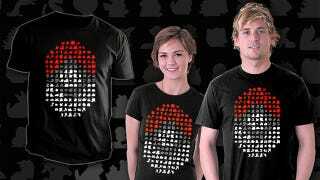 Hopefully this simple t-shirt design is something Pokémon fans would want to buy and wear. Well I definitely wanted to buy it, but I purchased the female version so I can giggle at how my partner's chest distorts the design. Well done, Deanlord!